This was fun. It wasn’t deep, but it was fun. 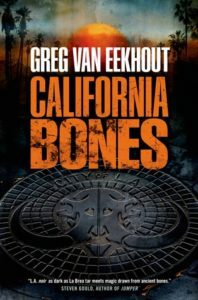 California Bones is set in an alternative present in which magic of various kinds works, and California is split into two independent polities — inexplicably not nicknamed Lo Cal and No Cal, although it is implied that southern California is colloquially known as the magic kingdom. The magic most prominent in the book is osteomancy, an arcane discipline in which the essence of magical or semi-magical creatures that were or are real in this world — gryphons, sphinx, kraken, cerebrus wolves, mammoth, saber-tooth tigers, and many more — can be appropriated by magicians who consume their remains. In most cases, they cook down the bones, but flesh will do the trick, too, if available. More darkly, the same principle holds true for other magicians, and the more powerful they are, the more puissance passes on to whomever eats them up. The story follows Daniel Blackland, the son of a powerful magician who rose high in the service of southern California’s absolute ruler, the Hierarch, and then fell out of grace and was consumed in one of the Hierarch’s periodic purges. Daniel managed to escape, and grew up under the protection of a boss in local organized crime. 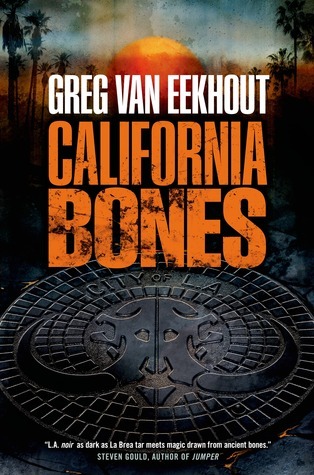 About halfway through California Bones, Daniel learns that he only survived at all because the Hierarch thought he had been killed by border guards when his mother crossed into her native northern California. The crime lord is named Otis, which may be a reference to Otis Chandler; van Eekhout populates his southern California with a few other notable names from our history. Under Otis’ tutelage and using the osteomantic abilities his father taught him, Daniel grows into a skilled thief and assembles a loyal crew that is capable of complex heists. When the main story starts, Daniel has left Otis’ employ and barely scraping by, lifting small bits of magical ingredients from the marketplace and staying half a step ahead of anyone who might betray his family history. Then one day Otis’ thugs pick Daniel up and bring him in as the boss convinces him to take on a big job: a theft from the Hierarch’s own hidden reserve of magical items. Otis wants some basilisk parts that will fetch a fortune. Daniel, Otis says, should take the sword that his father was working on when the Hierarch captured him. Not only is it a potent weapon, more potent in Daniel’s hands, but there is enough of his essence in it that if the Hierarch chose to examine it, he could discover that Daniel is not as dead as he thinks. It’s a lure and a warning. The rest is a good, solid heist story. Daniel re-gathers the surviving members of his old team, despite some misgivings because of how their last job ended. Van Eekhout also shows how the Hierarch’s world looks from the inside, with several chapters following someone within the security services who has figured out that Daniel is still alive. It’s akin to someone in Stalin’s Soviet Union finding out that there really is a Trotskyist plot to overthrow the ruler: dangerous to know, more dangerous to tell anyone who might do something about it, possibly more dangerous still not to tell anyone. The setting is a vividly changed Los Angeles. A different path of development means that canals have replaced freeways in the city’s building, so that it’s much like large-scale Venice on the Pacific. The La Brea Tar Pits were one of the great sources of magical bones that powered southern California’s independence and economy. Griffith Observatory is the setting for a glamorous party, and Disney plays an important role too. The pace is brisk, and van Eekhout puts in enough obstacles and reversals to keep the excitement high and the page turning compulsive. I tore through California Bones in about a day and a half. There are two more books in the set, Pacific Fire and Dragon Coast, and I look forward to finding out what else is happening in this darkly sorcerous California.